Full cladding and overlay faux wood Carriage House doors combine the beauty and texture of natural wood with the energy efficiency of an insulated steel door. Half-inch thick polymer composite cladding and overlay materials are molded from actual wood to replicate the species' natural texture and intricate grain patterns. Five-layer construction: steel + insulation + steel + full cladding + overlay (see construction tab). 2"- Intellicore® insulation with a thermal break. R-value of 20.4. Calculated garage door section R-value is in accordance with DASMA TDS- 163. Available composite cladding materials are Clear Cypress, Mahogany and Pecky Cypress (see below). 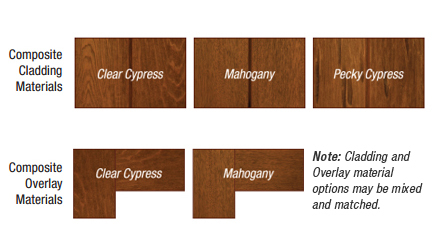 Available composite overlay materials are Clear Cypress and Mahogany. Factory finish options are Walnut, Dark, Medium and Whitewash. Doors can be ordered primed for those homeowners wishing to custom paint or stain their doors. Your choice of rectangular, square, or true arched window designs in clear, obscure, seeded or insulated glass. Window grilles are removable for ease of cleaning. Shown with Pecky Cypress cladding and Clear Cypress overlays. SeeDesign Options tab for composite cladding and overlay options (Material Design Options). Garage doors featuring Intellicore®insulation technology represent the ultimate smart choice for homeowners. Clopay’s Intellicore® is a proprietary polyurethane foam that is injected into a garage door, expanding to fill the entire structure. The result is a door with incredible strength and durability. Read More. 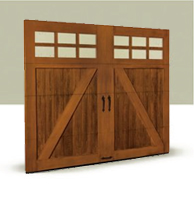 Customize your Canyon Ridge Collection garage door with your choice of wood species, color, panel design, top section, and decorative hardware. You can also custom paint or stain your door in the field. Illustrations below are shown in the Dark finish. Other finishes available. See below. Clopay's most energy-efficient garage doors were just named one of the year's "Hot 50 Products" by GreenBuilder magazine in its annual list of innovative, high-performance, eco-friendly products.